With the scaling back of Attack Wing to just card pack expansions and paint-your-own models I thought Wizkids tabletop strategy game was being put out to pasture. 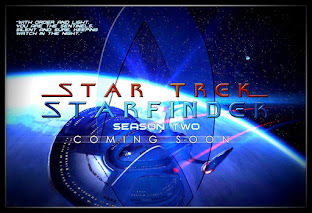 While there are no new individual ship packs being produced at the moment I may not be completely right in my assumption because we're also seeing the release of a new starter pack (Federation versus Klingons) plus the all singing and dancing Faction Packs offering new players an instant fleet and allowing veteran campaigners a way to quickly build up their armadas. 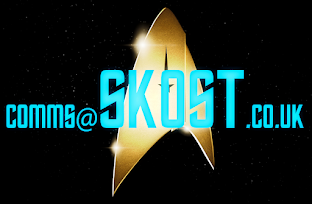 Currently there are four available - Romulans and Independents being two and we'll be covering the other pair on SKoST. In my case I've just got hold of the Dominion Faction Pack. As a big Deep Space Niner I disappointed myself by not adding a lot of this body to my collection. 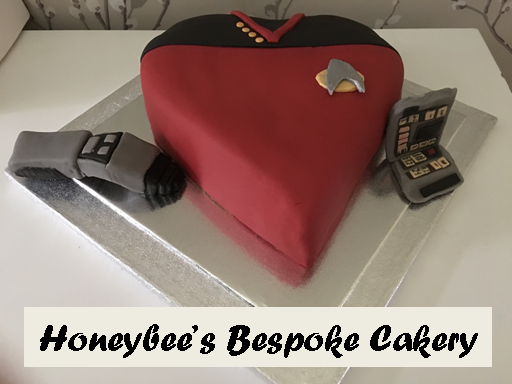 So to the ships and as you will recall (obviously...!) from previous reviews, we've seen the repaints for the Jem'Hadar Fighter and the Dominion Battleship previously as part of both Wave 31 and the Fighter independently as the Robinson way back in Wave 21. So if you want to see my thoughts on those ships, take a ganders HERE. For me, the big win here is the inclusion of the Dominion Battle Cruiser last seen in Wave Six a fair few years ago. 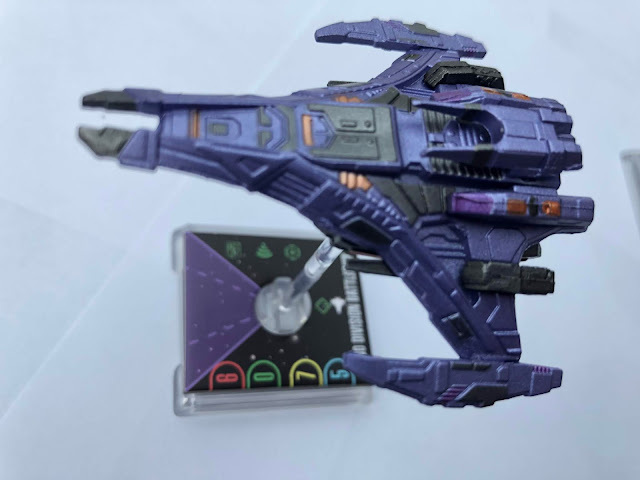 It's been spruced up in a fetching purple paint scheme to match the two other ships in the set. The level of panel detail on this one is extraordinary with raised sections right across the hull both in the base colour and neatly highlighted in a metallic orange. 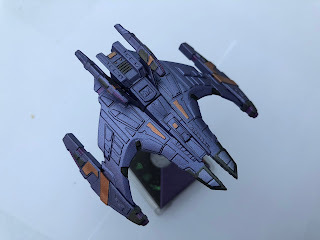 It does feel that this one has been pimped out a bit considering the rather sparkly purple Wizkids have coated this one in alongside the three other ships in the set. The darker colour panelling (black) isn't so neatly applied to the Battle Cruiser, noticably blotchy and ill-defined at the pincher-esque bow and on some of the wing detail. But it's still a great mould that has some very tight little angles and markings especially to the rear and the engine structures protruding from the rear. One thing that has changed between Wave 31 and this pack is that the paint scheme weathering seems to have disappeared completely reverting to more solid colours. This is very evident on the Battle Ship in the areas where it is now that dark grey/black just behind the nose section. Probably easier to batch paint a more opaque colour than go all artsy with the weathering. The largest of this fleet is the 2nd Division Battleship weighing in at a hefty 35 points with six attack, zero defence, seven hull and five shield points. It doesn't have much over the Battle Cruiser with no inbuilt defence however it does carry six upgrade slots with three for Weapons, one for Tech and two for Crew and the benefit with the Faction Pack is, there's a lot to chop and change between your craft. Cunningly the unique action for the Battleship allows it to either repair a Hull or Shield point if it performed a green manoeuvre. It can also perform Target Lock, Scan and Battle Stations should the need arise. As for moving, the large Dominion ship can green manoeuvre at speeds one, two and three which also allow for a bank turn left or right. The ship can reach up to speed five with a 90 degree turn at speed three requiring an auxiliary power token as both are red. With only slightly lower points, the Third Division Battle Cruiser rocks in with five in attack, one defence, six hull and five shields perhaps offering a little more even keel than the high-powered and highly offense-driven Battleship. It's unique action might not assist in it's longevity in the game as with the 35 point capital craft but it does offer any Attack Ships in range one an additional defence die which would be damn useful considering there are two of them in this box. The Cruiser also benefits from the Evade action as well as Scan, Target Lock and Battle Stations and slots for two Tech, one Weapon and two Crew upgrades. Movement-wise this one has green moves at range one forward and banking left/right, a full set of turns, banks and forward at speed two; the 90 degree turns on speed three are red as is the Come About action available at speed four - not a regular occurrence for this! The Second and Sixth Wing Patrol Ships both carry a cost of 16 points with three attack, two defence, three hull and three shield points to utilise. Both also pack a Tech, a Weapon and two Crew slots for upgrades - the latter of which seems to be a faction trait and a constant over the ships in the set. As with the Battle Cruiser they have a full range of inbuilt actions but they do have one difference in their Unique Actions. 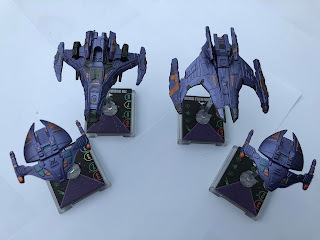 The Second Wing choice rolls an additional two defence die if there is another Jem'Hadar ship within range one while the Sixth Wing version offers an additional attack die if it's in close proximity (range one) to another Jem'Hadar craft. Pair this up with the Cruiser and you could be looking at a five dice defence for the 2nd Wing Patrol Ship should you choose to have it bolted to the side of the 33 point Cruiser. As for manoeuvring, the Patrol Ships offer the same green moves at range one as the Cruiser with the bank turns and forward at speed two also being green. All moves are available at speed three and the forward at four with the Come About being a red move at speed three. All in all it's a pretty nippy set to play with lots of options to get around the battlefield. 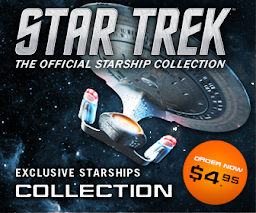 Four ships also means four Captain options and even better - none of those zero point generic ones to fill out the pack. Starting at the top of the pile we have the Female Changeling with a skill of nine and the ability to carry an Elite Action for a cost of six points. 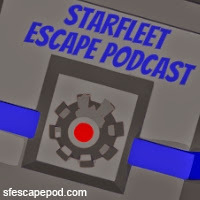 This one's "flippable" to act as your Fleet Admiral too should you choose. Her action allows you to an Action from the Action Bar and one from a Dominion crew card at the cost of decreasing your Captain Skill for the round. For the cost at least this one's reusable and a one point skill reduction is well worth the chance to be able to function more during a round. Yelgrun is the first of two Captain cards costing four points and giving you a skill of six. This one does allow you to field an Elite Action card as well which is a big plus considering the other card with the same skill and cost doesn't. Deyos isn't quite such a catch for players relinquishing the Elite Action but still costing four points to purchase for your fleet. Targeting a friendly ship at range one to one allows you to re-equip a discarded upgrade but stops that ship from attacking in that round. Again good as a renewable energies card, this one - as with a lot of the Dominion cards - keeps on giving without fear of disabling or discarding. Last but not least we have the two point costing Kilana with a Captain Skill of four. Harbouring an Elite Action option, this seems a better choice than Deyos due to both that and that she will take the Time Tokens for a Tech upgrade rather than that card taking the damage. Dead useful and means that some cards become a lot more useful in the right hands. The Dominion Pack isn't just squeezing in some decent commanders, no way. 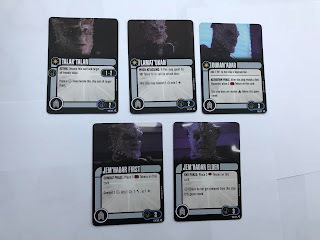 We have five Crew cards all featuring Jem'Hadar soldiers. Jem'Hadar First, Jem'Hadar Elder and Duran'Adar all costing three points and Talak'Talan and Lamat'Ukan costing two points. The First allows you to convert one BattleStation into a blank die, an Evade or a Damage point. I suspect that this should be converting a blank die into a Battle Station and someone's put the symbols in the wrong place. The cost for this is three Time Tokens on the card which does mean it's reusable. The Elder again comes at the price of three Time Tokens to use its feature but in the End Phase this stops Battle Stations tokens from being taken out of play when the round resets. 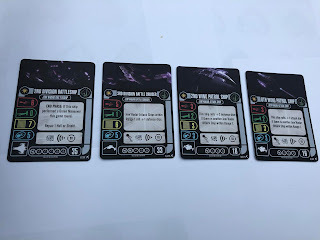 This isn't something we see very often in Attack Wing and demonstrates that the designers have really had a big rethink when it comes to these Faction Packs. Duran'Adar allows you to add another Tech upgrade to your ship. It's the third card that has to receive three Time Tokens for its use but this means you can use a Red Maneuovre and not pay the price of an Auxiliary Power Token. 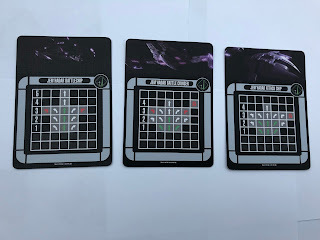 All three of the three point cards are definitely worth a punt given that they can be used over and over again during the game and have some fairly decent play options. 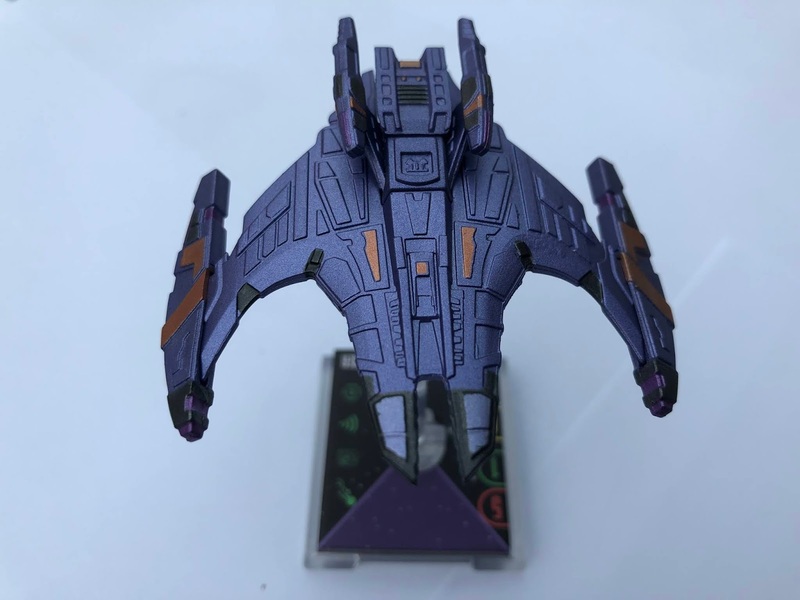 Talak'Talan operates at range one to two and targets all friendly ships to gain a Battle Stations token - this means that the other fleet craft can then take advantage of their own individual actions with a freebie. For two points it's not a bad cost to pay but it's not an action to be using lightly so make sure this one's planned in well. Lamat'Ukan rounds out the five with the chance to convert a blank die into a damage point as long as you've used your Target Lock during Attack. Decent enough for the minimal cost and it's another card in this pack that can be used again and again with no fear of discard or disabling. If five Crew choices isn't enough then you'll be blown away with the five Weapons options. 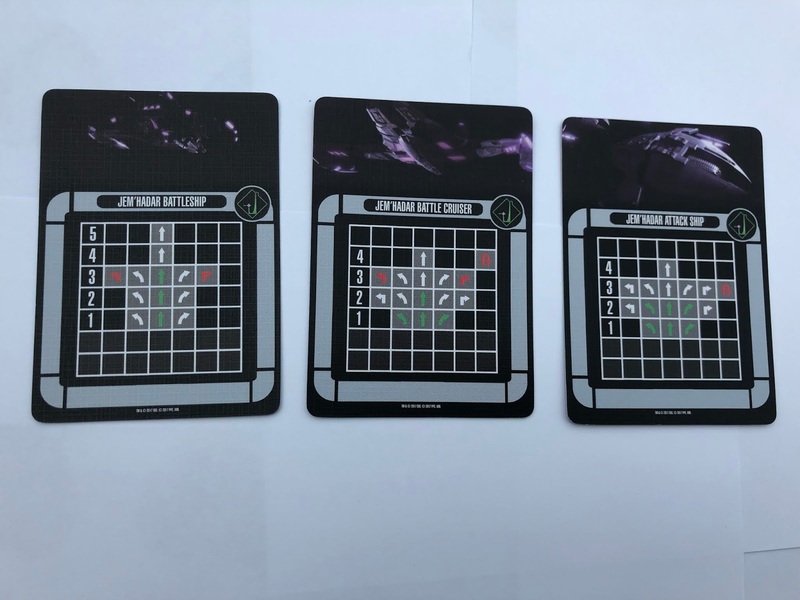 The two point Minesweeper card allows a Jem'Hadar craft to avoid hitting that wonderful Minefield token (works at range one) and roll an attack die to work out what happens - will you eliminate it or will the minefield activate as normal? It's a literal gamble on this one but at least it's not the near certainly of receiving a shedload of damage from stumbling straight into it. Energy Dissipator is craft-specific to the Jem'Hadar Fighters, costing two points and operating at range one to two. 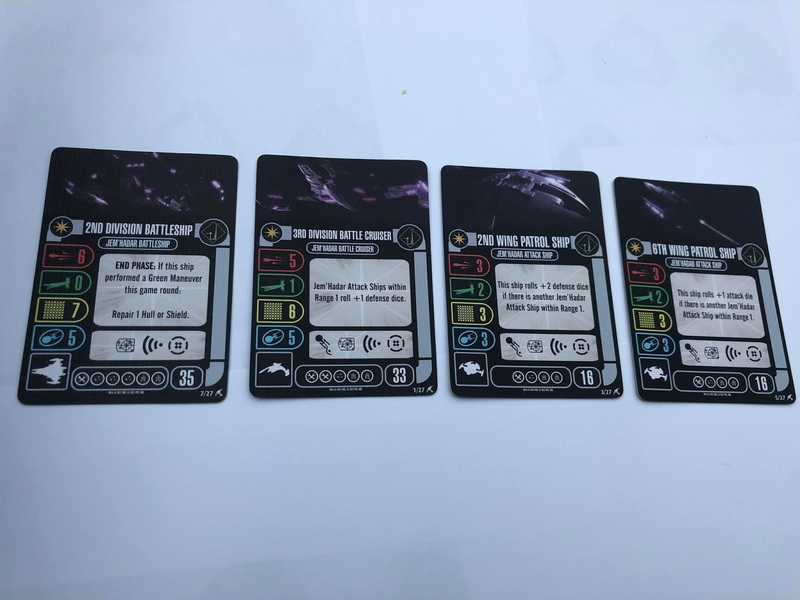 Being a discard you know it's a decent hit rate and this one allows you to remove one Tech upgrade for each uncancelled Damage or Critical Damage hit from the three attack dice rolled. Cool double result on that and note it can only be fired forwards. Phased Polaron Beam costs three points and again operates at ranges one and two and is craft specific to the Jem'Hadar Fighter. This time you disable to attack with three dice through the opponent's shields (if any) and can convert a Battle Stations result into a Damage point. Understandably one you need to reactivate there's only a maximum of three Damage you can hit here. The other three point card is Disruptor Cannon. Markedly more powerful this six dice attack (yep, six) is an unsurprising discard and can be performed twice by the Jem'Hadar Battleship. 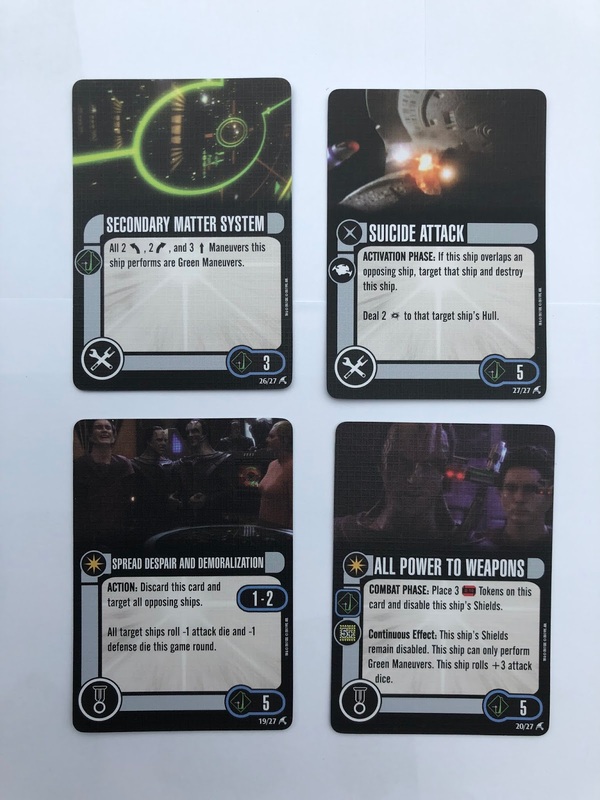 Effective at close and medium range this is an unforgiving attack essential to equip on your larger ship allowing for a maximum 12 dice attack for three point cost and a Target Lock. No brainer in my book. 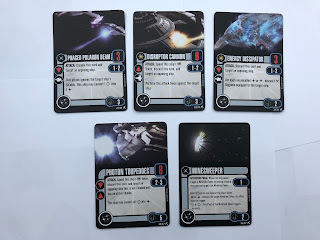 Oddly costing five points and the final Weapon upgrade which can be deployed on any ship in your fleet is Photon Torpedoes. A rather hefty eight dice attack at ranges two or three, it works against uncloaked ships and they must be unshielded. It seems very much like an over the top finishing move but combine with the Disruptor Cannon and you could have a very strong couple of rounds here. Did I add in there that it also converts all Battle Station results to Damage? Probably a good thing this is a one shot card which also needs to use the Target Lock feature. Overdoing it in the weapons department, the Dominion pack reins it back in with only two Tech upgrades. The three point Secondary Matter System benefits movement with all two banking and three forward motions acting as green (and thus giving the extra chance to knock off that annoying Auxiliary Power Token you just picked up). It means you don't have to slow to make a repair so to speak and can maintain the pace of your game. Plus it's one that's in continuous operation neither discarded or disabled if used. Suicide Attack is a final gasp for some form of glory in that if your base is overlapping during Activation then you can deal two Damage to the opponent you've crossed and also sacrifice your own craft. Only for use with the Jem'Hadar Fighters, this one is very, very final. 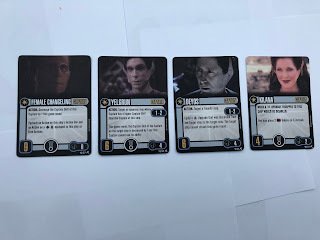 Last up there are two Elite Actions which, in this pack, you can use with the Female Changeling, Yelgrun and Kilana Captain cards. Spread Despair and Demoralization functions at ranges one and two against all opposing ships within that vicinity. Costing five points it reduces the attack and defence capabilities of those craft by one die, thus giving you a slight tactical advantage. Love the name on this one because it does mean your opponents are less capable for a round plus it might just do exactly what it says on the tin. A further five points will buy you All Power to Weapons. By disabling your shields and placing three Time Tokens onto the card during Combat it remains active. What it doesn't specify (but must occur) is that this is in play until the Time Tokens "run out". Available for any of the Dominion ships, the chosen ship can only perform Green moves and rolls an additional three attack dice. 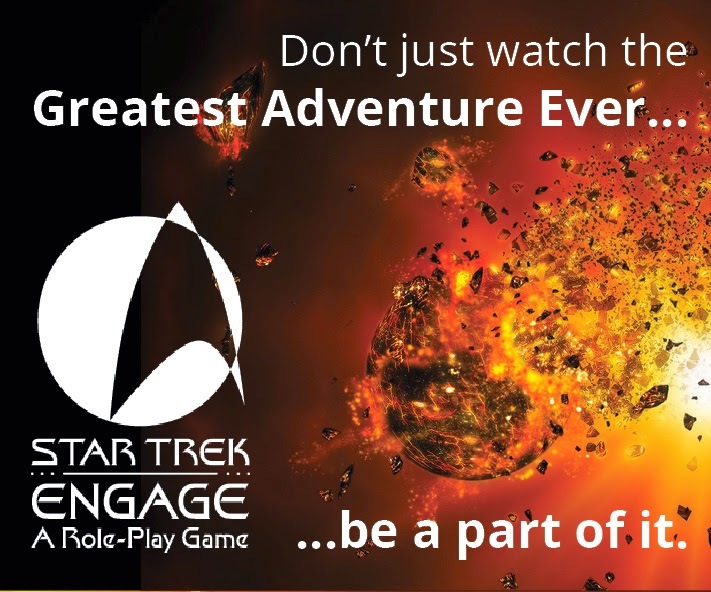 Smash this on the Battleship and you could be launching a nine dice attack or possibly 11 if combined with the one-off Photon Torpedoes card. Mammoth attack opportunity with this in play and definitely a game changing card. For new players the Dominion Faction pack allows you to hit the ground running with a complete four ship fleet and all the pieces you need to battle the Federation. I was dumb enough not to get these on the first run through leaving me waiting for the repaints and with this I have pretty much every faction well and truly covered. The larger ships here do have the potential to be ridiculously overpowered by attaching some of the higher Weapon and Tech cards but one thing that is an improvement is the limitation of some features to particular types of ship. 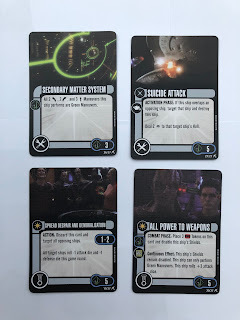 The slight redesign of the cards plus the detailed repaints really have worked for me and given Attack Wing a new, late, lease of life beyond simple card expansions and this is one pack that will definitely be getting a lot of use. The Dominion Faction Pack is available now from all good retailers of Asmodee Games in the UK. Check their website for further details. If you enjoyed this article or know someone that might, please share! Have you added the Dominion to your fleet? What feature combinations work out the best?